Dimensions 0.75 by 6 by 8.75 in. Creek Indians; History; 18th century. 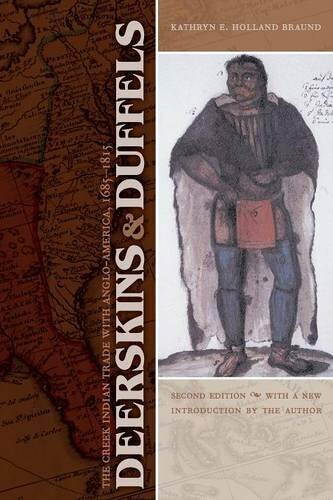 Deerskins and Duffels documents the trading relationship in the eighteenth century between the Creek Indians and the Anglo-American peoples who settled in what is now the southeastern United States. The Creeks were the largest Indian nation in the Southeast, and through their trade alliance with the British colonies, they became the dominant Native power in the area. The deerskin trade became the economic lifeblood of the Creeks after European contact. This book is the first to examine extensively the Creek side of this trade, especially the impact of commercial hunting on all aspects of Indian society. British trade is examined as well: the major traders and trading companies, how goods were taken to the Indians, how the traders lived, and how trade was used as a diplomatic tool. The author also discusses the Creek-Anglo cooperation in the trade of Indian slaves that resulted in the virtual destruction of the Native peoples of Florida. This second edition features a new introduction by the author. About: Deerskins and Duffels documents the trading relationship between the Creek Indians in what is now the southeastern United States and the Anglo-American peoples who settled there. 2 edition from Univ of Nebraska Pr (November 1, 2008); titled "Deerskins and Duffels: The Creek Indian Trade With Anglo-America, 1685-1815"
About: Deerskins and Duffels documents the trading relationship in the eighteenth century between the Creek Indians and the Anglo-American peoples who settled in what is now the southeastern United States.